Each time the Oilholic is Stateside, one feels obliged to flag up petrol prices at the pump, often a cause of complaint from US motorists, spooking presidents to seek a release of the Strategic Petroleum Reserves. So here's the latest price snap (left) from a petrol station at Mission San Jose, California captured by yours truly while in the South San Francisco Bay. And the price is per gallon, not litres, a pricing level that drivers in Europe can only dream of. With the shale bonanza, chatter is growing that the US should end its ban on crude oil exports. The ban was instituted in wake of the 1973 OPEC oil embargo and has been a taboo subject ever since. However, the prices you see above are the very reason a lifting of that ban is unlikely to end over the medium term. Argument used locally is the same as the one mooted for the unsuccessful bid to prevent US natural gas exports – i.e. end consumers would take a hit. While in the case of natural gas, industry lobby groups were the ones who complained the loudest, in the case of crude oil, consumer lobby groups are likely to lead the fight. That's hardly an edifying prospect for any senator or congressman debating the issue, especially in an election cycle which rears its head every two years in the US with never ending politicking. Just ask 'now Senator' and Democrat Ed Markey! But to quote someone else for a change – Senate Foreign Relations Committee Chairman Robert Menendez, another Democrat, has often quipped that lifting the ban would benefit only major oil companies and could end up "hurting US drivers and households" in the long run with higher gasoline prices. Not all Democrats or US politicians are opposed to the lifting of a ban though. Senate Energy and Natural Resources Chairman Mary Landrieu and Republican Senator Lisa Murkowski support a lifting of the ban. Both recently called on the EIA to conduct a detailed study of the effects of crude oil exports. "This is a complex puzzle that is best solved with dynamic and ongoing analysis of the full picture, rather than a static study of a snapshot in time," they wrote in an April 11 letter to EIA Administrator Adam Sieminski. However, in all honesty, the Oilholic expects little movement in this front. Read up on past hysteria over the slightest upward flicker at US pumps and you'll get your answer why. One must be thankful that the debate is at least taking place. That too, only because US crude oil inventory books keep breaking records. Earlier this month, the market was informed that US inventories had climbed to their highest level since May 1931. So what are we looking at here – stockpiles at Cushing, Oklahoma, the country's most voluminous oil-storage hub and the delivery point for New York futures, rose by 202,000 barrels in the week ended April 25. The news trigged the biggest WTI futures loss since November last year as a Bloomberg News survey estimated the net stockpile level to be close to 399.9 million last week. That said, nothing stops the likes of Markey from blowing hot air or speculators from netting their pound of flesh. According to the Commitment of Traders (COT) data released by the Commodity Futures Trading Commission (CFTC) on Friday, traders and speculators increased their overall bullish bets in crude oil futures for a fifth straight week, all the way to the highest level since March 4 last week. The non-commercial contracts of crude oil futures, primarily traded by large speculators and hedge funds, totalled a net position of +410,125 contracts for the week ended April 22. The previous week had seen a total of +409,551 net contracts. While this represents only a minor change of just +574 contracts for the week, it is still in throes of a bull run. That's all from San Francisco folks! Keep reading, keep it 'crude'! © Gaurav Sharma 2014. 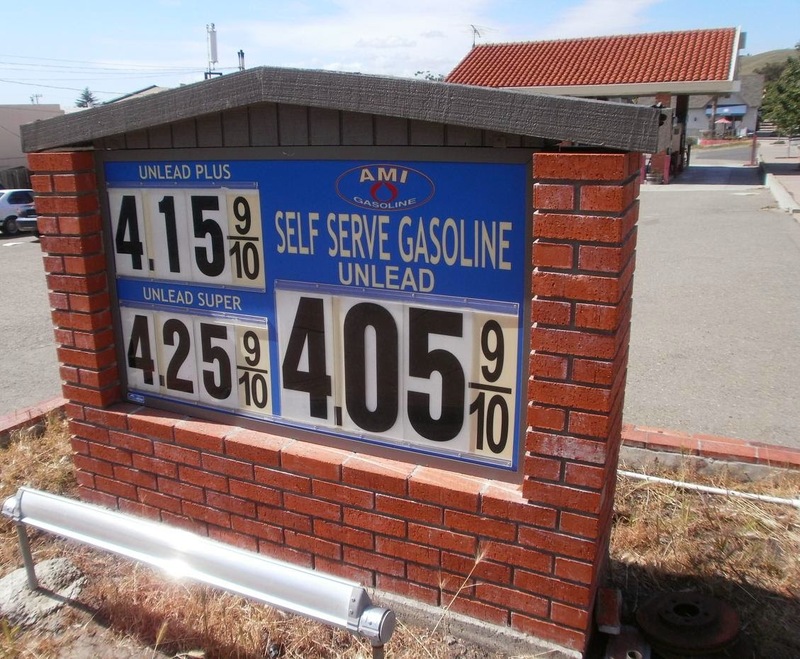 Photo: Gasoline prices at a station in Mission San Jose, California, USA © Gaurav Sharma, April, 2014. 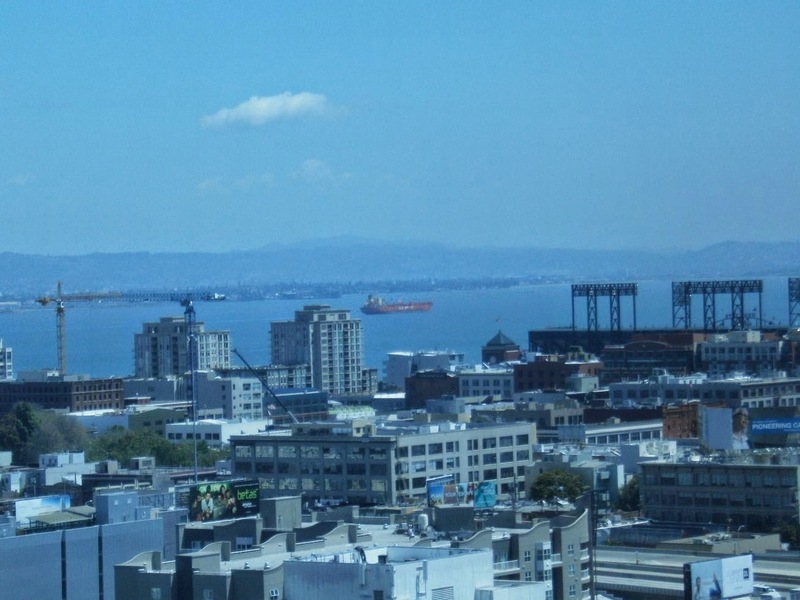 The Oilholic finds himself in the San Francisco Bay Area yet again for the briefest of visits. By force of habit, one couldn't help doing a bit of tanker spotting from a vantage point some 21 floors above on a gloriously sunny day. More importantly, it's always a pleasure to discuss the stock market prices of companies behind what these metallic behemoths at sea are carrying. The trading community appears to be in bullish mood close the midway point of 2014. Yours truly spoke to seven traders based here, most of whom had a buy recommendation on the big four services companies, which is not entirely unexpected. Five also had a buy recommendation on EOG Resources, a company the Oilholic admits has largely gone under his radar and Enterprise Products Partners, which hasn't. The former, according IHS Energy data, saw a 40% rise in value to just under US$46 billion in 2013, making the company the largest market capitalisation gainer for upstream E&P companies last year. Now that is something. It is blatantly obvious that the liquids boom in North America is beginning to drive investment back into all segments of the oil & gas sector. 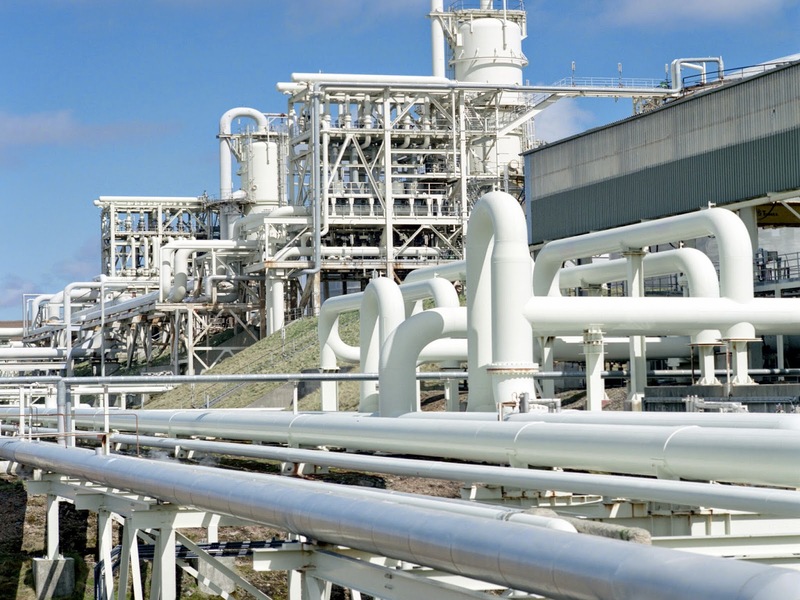 Midstream companies are in many cases offering good returns akin to their friends in the services sector, given their connect to the shale plays. Okay now before you all get hot under the collar, we're merely talking returns and relative stock valuation here and not size. And for those of you who are firm believers of the 'size does matter' hypothesis, latest available IHS Energy data does confirm that the 16 largest IOCs it monitors posted a combined market capitalisation of $1.7 trillion at the end of 2013, a little over 10% above their value the year before. Yet, oil majors continue to divest, especially on the refining & marketing (R&M) side of the business and occasionally conventional E&P assets where plays don't gel well with their wider objectives. Only last week, BP sold its interests in four oilfields on the Alaska North Slope for an undisclosed sum to Hilcorp. The sale included BP's interests in the Endicott and Northstar oilfields and a 50% interest in each of the Liberty and the Milne Point fields. Ancillary pipeline infrastructure was also passed on. The fields accounted for around 19,700 barrels of oil equivalent per day (boepd). Putting things into context, that's less than 15% of the company's total net production on the North Slope alone and near negligible in a global context. BP said the deal does not affect its position as operator and co-owner of Prudhoe Bay nor its other interests in Alaska. But for Hilcorp, which would become the operator of Endicott, Northstar and Milne Point and their associated pipelines and infrastructure pending regulatory approval, it is a sound strategic acquisition. Going back to the core discussion, smart thinking could, as the Bay Area traders opine, see all sides (small, midcap and IOCs) benefit over what is likely to be seminal decade for the North American oil & gas business between now and 2024-25. As Daniel Trapp, senior energy analyst at IHS and principal author of the analysis firm's Energy 50 report, noted earlier this year in a note to clients: "While economic and geopolitical uncertainty will certainly continue driving energy company values, it is clear that a thought out and well-executed strategy positively affects value. "This was particularly true with companies that refocused on North America in 2013, notably Occidental, which saw its value expand 24%, and ConocoPhillips, which grew 23% in value." There seem to be good vibes about the performance of North American refiners. As promised to the readers, yours truly wanted to know what people here felt. 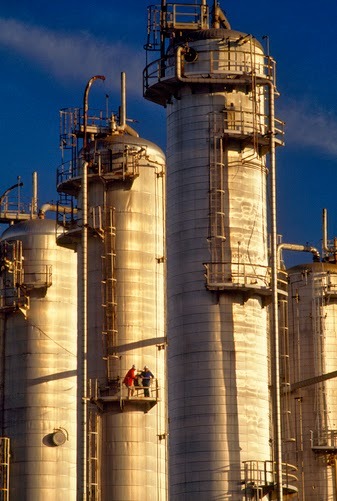 Ratings agency Moody's said earlier this month that North American refiners could retain their advantage over competitors elsewhere in the globe, with cheaper feedstock, natural gas prices, and lower costs contributing to 10% or higher EBITDA growth through mid to late 2015. Those with investments and stock exposure in US refiners reckon the Moody's forecast is about right and could be beaten by a few of the players. A few said Phillips 66 would be the one to watch out for. Question is – what will these companies do with their investment dollars going forward in light higher profits, as the case for pumping in more capex into existing infrastructure is not clear cut, despite the need for Gulf Coast upgrades. Additionally, most anecdotal evidence here in California suggests tightening emissions law in the state is price negative in particular for Tesoro and Valero, but Phillips 66 could take a hit too. In essence, not much has changed in terms of the legal parameters; only their impact assessment in 2014-15 is yet to reach investors' mailboxes. On a related note, here is an interesting piece from Lior Cohen of the Motley Fool, examining the impact of the shrinking Brent-WTI spread on refiners. Valero and Marathon's first quarter performance could be negatively impacted as the spread narrows, the author reckons. Overall, in the Oilholic's opinion what appears to be an abundance of low-cost feedstock from inexpensive domestic crude oil supply will continue to benefit US refiners. While North American refiners should be content with abundance, Europeans are getting pretty discontent about their reliance on Russian gas. Despite obvious attempts by the European Union to belatedly wean itself off Russian gas, Fitch Ratings reckons the 28 member nations group would be pretty hard pressed to replace it. In fact, an importation ban on Russian gas to the EU would cause substantial disruption to Europe's economy and industry, according to the agency. Painting a rather bleak picture, Fitch noted in a recent report that the immediate aftermath of such a move would see the region suffer from gas shortages and high prices due to its limited ability to reduce demand, source alternative supplies and transport gas to the most affected countries. A surge in gas prices after a ban would probably also have knock-on effects on electricity, coal and oil prices. Industry would bear the brunt of supply shortages as household demand would be given priority. A lengthy ban on Russian gas – described as "a low-probability, but high-impact scenario" would see gas-intensive sectors such as steel and chemicals being heavily hit. This would accelerate the closure or mothballing of capacity that is suffering from low profitability due to competition from low-cost energy jurisdictions such as the US or Middle East. In 2013, Russia supplied 145 bcm of gas to Europe, and the latter would have great difficulty in sourcing alternative supplies. "Increased European gas production and North African piped gas could offset a small proportion of this. Tapping into the global LNG market would yield limited volumes as Europe's Russian gas demand equates to nearly half of the world's LNG production, which is already mostly tied to long-term supply contracts. Hence, gas and other energy prices could surge," the agency noted. In theory, Europe has plenty of unused LNG regasification capacity, which could help replace some Russian supplies. But the majority of plants are located in Southern Europe and the UK, far away from the Central and Eastern European countries that are most reliant on Russian gas. So there you have it, and it should help dissect some of the political hot air. That's all for the moment from San Francisco folks! Keep reading, keep it 'crude'! © Gaurav Sharma 2014. Photo 1: San Francisco skyline from 4th Street with an oil tanker heading to Oakland in the background. 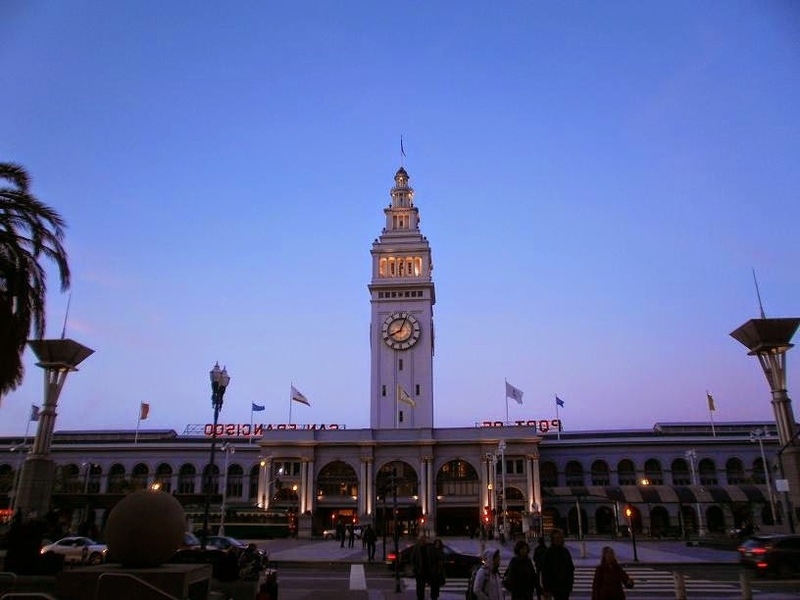 Photo 2: Port of San Francisco, California, USA © Gaurav Sharma April, 2014. The vexing question for European Union policymakers these days is who has what level of exposure to Russian gas imports should the taps get turned off, a zero storage scenario at importing nations is assumed [hypothesis not a reality] and the Kremlin's disregard for any harm to its coffers is deemed a given [easier said than done]. Depending on whom you speak to, ranging from a European Commission mandarin to a government statistician, the figures would vary marginally but won't be any less worrying for some. The Oilholic goes by what Eurogas, a non-profit lobby group of natural gas wholesalers, retailers and distributors, has on its files. According to its data, the 28 members of the European Union sourced 24% of their gas from Russia in 2012. Now before you say that's not too bad, yours truly would say that's not bad 'on average' for some! For instance, Estonia, Finland, Lativia and Lithuania got 100% of their gas from Russia, with Bulgaria, Hungary and Slovakia not far behind having imported 80% or more of their requirements at the Kremlin's grace and favour. On the other hand, Belgium, Croatia, Denmark, Ireland, Netherlands, Portugal, Spain, Sweden and the UK have nothing to worry about as they import nothing or negligible amounts from Russia. Everyone in between the two ends, especially Germany with a 37% exposure, also has a major cause for concern. And it is why Europe can't speak with one voice over the Ukrainian standoff. In any case, the EU sanctions are laughable and even a further squeeze won't have any short term impact on Russia. A contact at Moody's says the Central Bank of the Russian Federation has more than enough foreign currency reserves to virtually guarantee there is no medium term shortage of foreign currency in the country. Industry estimates, cited by the agency, seem to put the central bank's holdings at just above US$435 billion. EU members should know as they contributed handsomely to Russia's trade surplus! Meanwhile, BP boss Bob Dudley is making a habit of diving into swirling geopolitical pools. Last November, Dudley joined Iraqi Oil Minister Abdul Kareem al-Luaibi for a controversial visit to the Kirkuk oilfield; the subject of a dispute between Baghdad and Iraqi Kurdistan. While Dudley's boys have a deal with the Iraqi Federal government for the oilfield, the Kurds frown upon it and administer chunks of the field themselves to which BP will no access to. Now Dudley has waded into the Ukrainian standoff by claiming BP could act as a bridge between Russia and the West. Wow, what did one miss? The whole episode goes something like this. Last week, BP's shareholders quizzed Dudley about the company's exposure to Russia and its near 20% stake in Rosneft, the country's state-owned behemoth. In response, Dudley quipped: "We will seek to pursue our business activities mindful that the mutual dependency between Russia as an energy supplier and Europe as an energy consumer has been an important source of security and engagement for both parties for many decades. We play an important role as a bridge." "Neither side can just turn this off…none of us know what can happen in Ukraine," said the man who departed Russia in a huff in 2008 when things at TNK-BP turned sour, but now has a seat on Rosneft's board. While Dudley's sudden quote on the crisis is surprising, the response of BP's shareholders in recent weeks has been pretty predictable. Russia accounts for over 25% of the company's global output in barrels of oil equivalent per day (boepd) terms. But, in terms of booked boepd reserves, the percentage rises just a shade above 33%. However, instead of getting spooked folks, look at the big picture – according to the latest financials, in petrodollar terms, BP's Russian exposure is in the same investment circa as Angola and Azerbaijan ($15 billion plus), but well short of anything compared to its investment exposure in the US. Sticking with the crudely geopolitical theme, this blogger doesn't always agree with what the Henry Jackson Society (HJS) has to say, but its recent research strikes a poignant chord with what yours truly wrote last week on the Libyan situation. The society's report titled - Arab Spring: An Assessment Three Years On (click to download here) - noted that despite high hopes for democracy, human rights and long awaited freedoms, the overall situation on the ground is worse off than before the Arab Spring uprisings. For instance, Libyan oil production has dramatically fallen by 80% as neighbouring Tunisia's economy is now dependent on international aid. Egypt's economy, suffering from a substantial decrease in tourism, has hit its lowest point in decades, while at the same time Yemen's rate of poverty is at an all-time high. Furthermore, extremist and fundamentalist activity is rising in all surveyed states, with a worrying growth in terror activities across the region. As for democracy, HJS says while Tunisia has been progressing towards reform, Libya's movement towards democracy has failed with militias now effectively controlling the state. Egypt remains politically highly-unstable and polarised, as Yemen's botched attempts at unifying the government has left many political splits and scars. Moving on to headline crude oil prices, both benchmarks have closed the gap, with the spread in favour of Brent lurking around a $5 per barrel premium. That said, supply-side fundamentals for both benchmarks haven't materially altered; it's the geopolitical froth that's gotten frothier. No exaggeration, but we're possibly looking at a risk premium of at least $10 per barrel, as quite frankly no one knows where the latest Eastern Ukrainian flare-up is going and what might happen next. Amidst this, the US EIA expects the WTI to average $95.60 per barrel this year, up from its previous forecast of $95.33. The agency also expects Brent to average $104.88, down 4 cents from an earlier forecast. Both averages and the Brent-WTI spread are within the Oilholic's forecast range for 2014. That's all for the moment folks! Keep reading, keep it 'crude'! Atop its contribution to geopolitical spikes and dives in the price of the crude stuff, an episode that unfolded over the past four weeks in Libya was nothing short of a farce. However, pay heed to a crucial figure mentioned in a precis of events detailed here. On March 11, Libyan armed rebels, who have been blockading the country's key ports on the pretext of demanding a greater share of oil export revenue since last July, decided to ratchet things up a notch. The so called Cyrenaica Political Bureau loaded up 234,000 barrels of the finest Libyan Light Sweet on to a North Korea-flagged oil tanker Morning Glory at the port of Sidra, defying orders from Tripoli. The then (but not anymore) Prime Minister Ali Zeidan threatened action calling the move an act of piracy. Going one step further, Zeidan said he'd bomb the tanker if it left Sidra! Thankfully while a bombing didn't take place, a naval blockade did. Yet, a brief tussle aside, the tanker escaped Libyan waters intact. Then rather dramatically North Korea said the tanker was "no longer" under its flag. No sooner had it departed Libyan shores, the egregious Zeidan saw himself scurrying to seek sanctuary in Germany, after being charged with "mishandling of the situation and embezzlement" by his peers in the General National Congress; the country's acting parliament. No claimant came forward for the cargo in international waters. Finally, a US Navy Seals squad boarded the tanker south of Cyprus and commandeered it back to Libya putting an end to the sorry tale! Farcical the episode might well have been, but it did flag up one crucial figure – 234,000 barrels. That's roughly what Libyan daily output is currently averaging down from a pre-July 2013 figure of 1.4 million barrels per day (bpd). The latter itself is well below levels seen prior to the uprising. Now on to the prologue – this week, as a "goodwill gesture", the Cyrenaica Political Bureau allowed two ports – Zueitina (south of Benghazi) and Hariga (East) to revert back to Tripoli's control. Ras Lanuf and Sidra would also reopen soon, according to the Libyan National Oil Corporation. So tension may well be easing as is reflected in the Brent price over the past few days. However, one thing is for sure, this 'post-Gaddafi democracy' Western governments have created, surely has no fans in the importers brigade! From upstream unpredictability in Libya to the predictable and rather mundane global downstream world, as BP announced it would cease production at its Bulwer Island refinery on the outskirts of Brisbane, Australia by the second quarter of 2015. The reason for closure is similar to reasons outlined for closures and refining & marketing divestment on the other side on the planet in Europe – i.e. lower consumption in developed markets coupled with the opposite being true in emerging markets. Economies of scale provided by mega-refineries from China to India that are cheaper to operate, make the likes of Bulwer Island, with a relatively tiny capacity of 102,000 bpd, uncompetitive. Or to quote Andy Holmes, president of BP Australasia: "Market reality is that global refining capacity is shifting to service the energy growth areas of the globe and is doing so with very large port-based refineries. We have concluded that the best option for strengthening BP's long-term supply position in the east coast retail and commercial fuels markets is to purchase product from other refineries." And in line with that sentiment, Holmes said Bulwer Island refinery, which has been refining since the 1960s, would become a multi-product import terminal. That's not a new concept either as Caltex is about to do something similar with its Sydney refinery. Additionally, Shell has exited the Aussie refining business altogether shuttering its Sydney refinery and selling the rest of the portfolio to Vitol. As of now, BP is still holding on to its 146,000 bpd Kwinana refinery on the Aussie west coast. But one wonders for how long? The news does not surprise this blogger. The Oilholic and several supply-side analysts have been harping on for a while that capacity additions will be necessity led in pockets of the globe where there is a need, and even these won't be very profitable enterprises. According to Moody's, only a modest rise in global demand for refined products of 1.2 million bpd is expected over 2014-15. Most of it would be met by net capacity additions in the Middle East and Asia. In fact, if projected Chinese capacity additions alone are taken into account, we're looking at a figure of above 1.2 million bpd through to 2015. A Middle Eastern guesstimate would be similar and we haven't even taken India into the equation. These additions would dilute earnings growth for the whole sector. Moody's says the end result could mean flat growth over the next 12 to 18 months in Europe, with a pressing need for meaningful capacity rationalisation to prevent margin erosion in 2015 and beyond. Asian refiners would see a 2% EBITDA growth this year, while their North American counterparts could retain their advantage over competitors elsewhere, with cheaper feedstock, natural gas prices, and lower costs contributing to 10% or higher EBITDA growth through mid to late 2015. Finally, Latin American growth for refined products will remain strong through mid to late 2015, with few capacity additions, but the region's reliance on costly refined product imports will hold back EBITDA growth to no more than 2%. Colombia's Ecopetrol is the only player likely to add regional capacity, however modestly, by 2015. Ironically, it's the one region that could do with additional capacity. Anyone from Pemex or Petrobras reading this blog? Just before one takes your leave, a news snippet worth flagging-up – engineering services provider Kentz will see its chief financial officer Ed Power retire in May following 24 years of service. His cool hand at the till along with that of former CEO Dr Hugh O'Donnell (whom this blogger had the pleasure of meeting at the 20th World Petroleum Congress in 2011) was crucial in guiding the company out of troubled times and into the FTSE 250. While wishing Power a happy retirement, Kentz has also played an absolute blinder in naming Meg Lassarat, the current CFO of Houston-based UniversalPegasus International, as his very worthy successor. Lassarat is widely credited for driving a five-fold increase in the revenue of UniversalPegasus to over US$1 billion (£603 million). So you can see why Kentz have headhunted her. Meanwhile, Ichthys LNG project in Australia continues to provide the company with good news. Kentz has bagged a $570 million contract for electrical and instrumentation construction packages at the project. The latest contract is atop a 50% stake in the structural, mechanical and pipeline construction contract for Ichthys with a headline valuation of $640 million. Put it all together and we're getting close to the $1 billion mark or to quote analysts at Investec – "an addition of 14% to Kentz's order book that underpins visibility into 2017". That's all for the moment folks! Keep reading, keep it 'crude'!